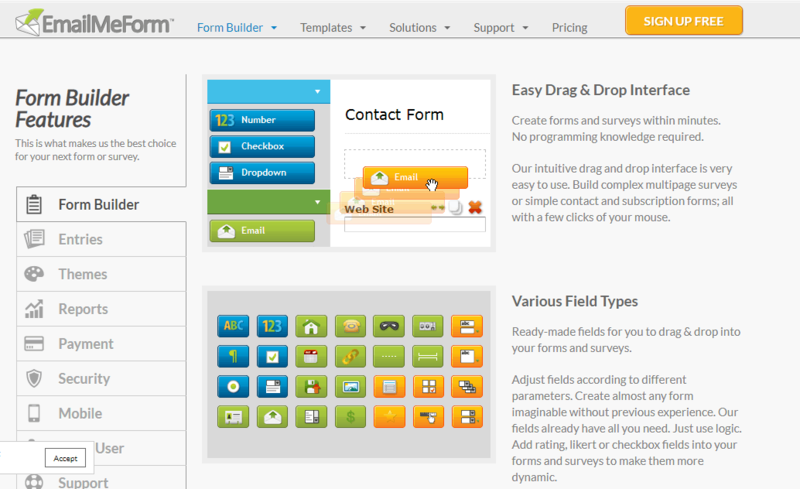 EmailMeForm offers basic form services for beginners, as well as advanced features for pros. That being said, EmailMe Form isn't the most sophisticated builder on the market, though it offers competitive prices, including unlimited forms and fields. 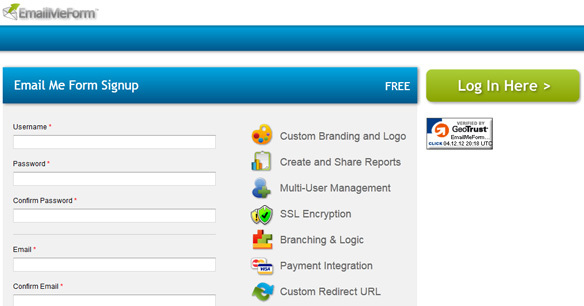 While limited in features and flexibility, free accounts are available at EmailMeForm. However, EmailMe Form’s platform offers a solid form builder that really delivers and ensures your assignments’s impact. Upgrading to paid plans enables you to really start integrating clever features and tools. The support and usability on offer can use improvements. Therefore, Form Builder is at the bottom of recommended platforms. Want to know if EmailMeForm is right for you? Templates on offer come handy to create basic pages. Template Selection: Among the template selection, you will find a number of headings, such as editable Forms, Surveys, Business, Registrations, and Tracking. The choice is business oriented and includes application forms, evaluations, contact forms, donation and campaign forms, among others. Forms are adaptable to whatever cause or business you are serving. Forms are mobile-friendly and secured in a database for form entries in your account. Customization: All templates and forms are customizable, via a user-friendly intuitive drag and drop interface, allowing you to build complex multi-page surveys, audits, reviews or contact and subscription forms. EmailMeForm offers a free account. However, it comes with constant bombardments, coaxing you to upgrade to a paid plan, through advertising and pop-up windows. This really encumbers usability and restricts you from testing the service to decide whether to upgrade or not. In addition, you need to login every time you leave the work area, which often results in aggravation. If you can get past that, or relent and upgrade to a paid plan, you will find decent functionality of their drag-and-drop interface. You have a choice of 6 Basic features (your checkboxes and fields) and 14 Advanced, which include likert and price input. Limited support on Free accounts; support consists in email forms that may take a while to be answered if at all. Their knowledge base is divided into several categories, from FAQ to Billing, Building, Payment Integration, General Questions, Data & Reports, etc. Paid accounts have access to “Extended Support” with no further information given. When upgrading to paid accounts, a must if you are going to work actively, using EmailMeForm, the most cost effective price for almost unlimited functionality begins at $9.95/mo. This is competitive compared to other platforms. Bear in mind, the storage and file uploads capability are limited. If that is essential, we advise you explore other platforms. EmailMeForm offers little value on its Free plan. Despite its reasonably priced paid plans, we recommend you explore other platforms for a more profitable and versatile experience. EmailMeForm could use some upgrading in the area of customer support and provide its users with backing, i.e. real people working behind the facade. Click here to try EmailMeForm.